Modern private Villa with Pool & shaded terrace walking distance to Palm Beach! Fully air-conditioned 5-bedroom Villa in Palm Beach Area with Private Pool! Only 750 yards from the world famous Palm Beach, Merlot Villas offers luxurious private villas situated within an exclusive safe gated community. The villa has its own private garden with pool and features a modern interior, free WiFi and a roof terrace offering beautiful sunset views. 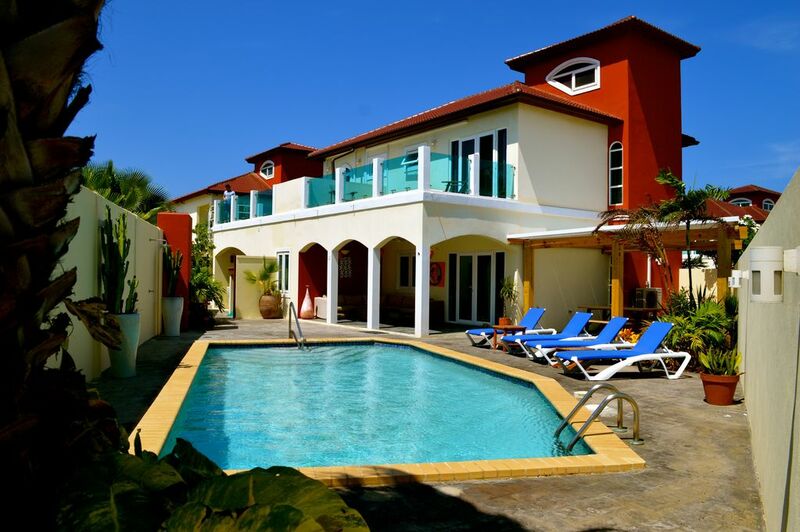 This Deluxe Six Bedroom Villa & Apartment with Pool is a 2500 sq. ft. private villa accommodating up to 14 guests. The spacious garden offers a large pool with lounge chairs, furnished shaded terraces with lounge set, dining set and built-in charcoal BBQ: ideal for outside dining. The villa features a separate living room, TV room, dining room and fully equipped kitchen. The master bedroom with king-size bed features an en-suite bathroom with bath and separate shower. The stairs in the master bedroom is leading to the loft room with two twin beds. The three additional bedrooms (one located on the ground floor) all have kingsize beds and en-suite bathrooms with shower. The garden room with separate entrance accessible from the garden features a bunk bed and has its own en-suite bathroom. The additional separate garden apartment with its own entrance features a kingsize bed, closet and private bathroom. Whether you are looking for a relaxing family vacation, a romantic getaway or a fun holiday with friends, Merlot Villas Aruba makes a memorable destination. A warm welcome and personal attention in combination with the intimate atmosphere of our exclusive villa community, creates an ultimate Aruba experience. Relax in your own private villa with pool, enjoy a private massage or spend a day at the beautiful Palm Beach. Complimentary washing facilities available at the villa. One beach towel and bath towel per guest. Smoking is only allowed outside the villa. Merlot Villas was perfect for our group of eight (four couples). We enjoyed the proximity to the beach and the amenities of the home. There was a convenient store located close by that helped with our basic needs! The villa itself was lovely and the staff were very responsive to inquiries and requests! Thanks for the hospitality! My friends and I loved our stay in Merlot Villas! The property was roomy and felt so secure. We walked to the nearby hotel casinos several nights on our stay and never felt unsafe. It was great having an alarm system as well. It was like a home away from home...a beautiful pool, plenty of outside dining space, a big balcony to relax outside, rooms with bathrooms in each, washer/dryer, and a kitchen stocked w/utensils for our convenience. It was also nice to have a corner store right across the street. We would totally stay again...next time a family trip with the kids! Rented a house at this private villa for my friend's birthday and all of us had the best stay there. Definitely would stay back there in the future. Thank you for your kind words. See you back soon. Traveling as a group of 8 it was nice to each have a king size bed and our own bathrooms! The house was located close to palm beach and was very easy to access groceries, restaurants and all attractions. This was our first time trying a house rental and would definitely do it again. We had a great outdoor area with a pool that was utilized on a daily basis. The property managers were very accommodating and quick to respond to any request we had! I would definitely recommend Merlots Villa's and hope to be back again soon! Thank you for your nice review. We really appreciate your kind words. Hopefully we can welcome you back soon ! Great location and place to stay in Palm Beach!!! This villa is spacious, clean, comfortable and felt very safe. Beds were nice. There were 8 of us and we all had our separate bedrooms and bathrooms. Pool outside was clean. Met both Ivan & Frank and they were very personable and helpful with our stay. We enjoyed our week at this villa and hope to make it back to Aruba/Palm Beach and stay there again! Thank you Missy ! You and your pleasant friends are very welcome and hope to see you soon. It was ok, not the best, not the worst. The staff that greeted us and that was there each time we had a problem (which was often) were very friendly. We started off with minor issues; only receiving 1 set of keys, no grill brush to clean the grill (and in the hand book it says to return 2 sets of keys and clean the grill or you will be charged). The rental car we were given was horrible. It was completely dented in on 1 side, the passenger side window did not roll down, the radio did not work, the windshield wipers were completely rusted and no GPS. We were told this was the last vehicle they had available. Next we noticed holes in the sheets (looked like burn marks and this is a no smoking villa? ), the dryer did not dry our towels after 3 hours so we had to hang them on the line outside (not a relaxing way to spend a vacation) and to top it off a drain in the master bathroom was clogged and caused the sink to leak. After an hour and a half of the plumber fixing the sink (and the smell was horrific) we were finally able to get ready for our day. The house had some other issue but fortunately they were in rooms we were not using. 2 major issues I had was before we came; there is a charge for each additional person over 2 people, we found out a month before arriving that 1 couple would not be able to make it so we let the owner know. He only refunded half of what we were charged for the 2 people. And finally we had a late flight out of Aruba and I sent an email requesting a later checkout;I was told that Ivan would be by to discuss it with me. We had been out for most of that day, I never received any other correspondence regarding the check out and did not see Ivan. On the day we were leaving the cleaning lady arrived at 10:20. Normal checkout isn't until 11am. I was told someone had stopped by the house to discuss it but we were not there....well it is our vacation so why shouldn't we be out? Should we have waited all day for someone to come talk to us when they could've just as easily emailed me back? So in conclusion; this was not the worst but it was also not the best place to stay! Thank you for the nice review ! I think we got the best review from you ever given to someone. Thank you also for your kind words about welcoming you with a birthday cake and balloons and with also free wine. We try to do our best with all our guests. Do not worry about the phone calls you made during the night to us. We were very happy to assist you when you could not find things or you did not understand how to turn on the dryer for example. We are also not angry that you broke the antenna of the car. Yes, the final cleaning was included and we cleaned all the empty bottles for you. There was indeed no need to clean the Villa a little bit before you left. Sorry we could not let you stay longer in the Villa because we enjoyed your stay so much. I think life is treating you well because of the very positive energy you and your family have towards other people. Thanks again for being our guest ! Located in the best part of Aruba lies Merlot Villas, a small exclusive gated villa community where luxury meets privacy. Merlot Villas Aruba is located in a quiet neighbourhood (right behind the Marriott Hotel) only 750 yards from Palm Beach (10 to 15 minute walk), one of the world’s most beautiful beaches. There is a mini-market right around the corner and golf courts, shopping malls, cinemas, bars and restaurants are also close by. - Rates are per night in USD and based on double occupancy, each additional guest is US$25 per night extra. - Children up to 2 years stay free of charge (baby cribs available upon request). - Rates include utilities (up to US$50 per night) and exclude US$125 final cleaning and 11% Tourist Tax/Environmental Levy.